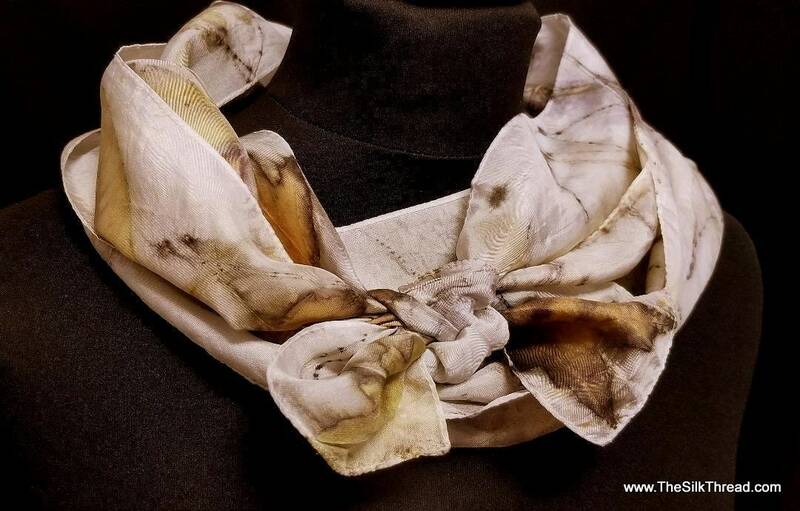 This beautiful silk scarf's design is created from an assortment of sweet gum, oak and maple leaves, interspersed with pine needles that I collected from my farm. The scarf length is 8" x 72" and it is 100% pure silk. The imprinted colors are a rich kaleidoscope of blue, bronzes, greens, golds and deep browns. Hints of purple pop here and there. Every scarf comes with a tag with the story of its making. A unique and unusual gift! Eco or natural dyeing or printing is the collecting and processing of Nature's leaves, plants, fruit and flowers to create rich, beautiful, permanent prints onto protein fibers such as silk and wool. Look closely to see if you can identify the plants used. You will often see not just the variety but both the positive and negative shapes of the leaves and flowers. (this is not "sun printing") The colors and shapes are the ACTUAL colors from the plants that are released during the long and time consuming process. SLow fashion sustainability at its best.